I picked this one up in the library because of the bright cover and then realised that it's basically a modern update of one of my old favourites: Pierre (who only would say "I don't care!") by Maurice Sendak. 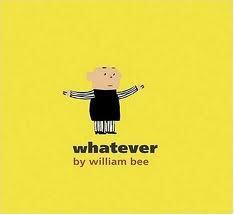 No matter what Billy's dad shows him, Billy's only response is "...whatever." Something very tall, something very small, the world's bounciest castle, or steamiest train - "...whatever." Even a trip in a rocket to the edge of outer space fails to impress Billy. Haha. Yes. A great story about one of the most annoying phrases ever.